Yard Limits: 9624 feet South of Junction Switch. 4142 feet South of station. 5817 feet North of station. 1855-06-02 O.S. & H.U.Rd. reaches Collingwood Cooper-2001, p. 392 . 1860-09-10 N.Ry. of Can. operates special train for His Royal Majesty, Albert, Prince of Wales Walker-1953, p. 8 . 1873c N.Ry. of Can. builds second station Cooper-2001, p. 285 . 1879-01-01 H. & N.W. Ry. opens to Collingwood Stevens, p. 418 . 1879-01-16 H. & N.W. Ry. operates official inspection train to Collingwood Cooper-2001, p. 393 . 1879-06-10 H. & N.W. Ry. and N.Ry. of Can. operate jointly as the N. & N.W. Ry. Cooper-2001, pp. 21 & 393 . 1898-01-17 Town of Collingwood By-law No. 519 to grant $25,000 bonus to G.T.Ry. for erection and maintenance of grain elevator with a capacity of at least 700,000 bushels Statutes of the Province of Ontario; Chapter 40 61 Vic. .
1905-06-19 Fire consumes the Northern Navigation Company's steamer City of Collingwood and the G.T.Ry. freight sheds The Globe (Toronto), Tuesday, June 20, 1905, p. 1 . 1932-03-12 C.N.Rys. (originally N.Ry. of Can.) 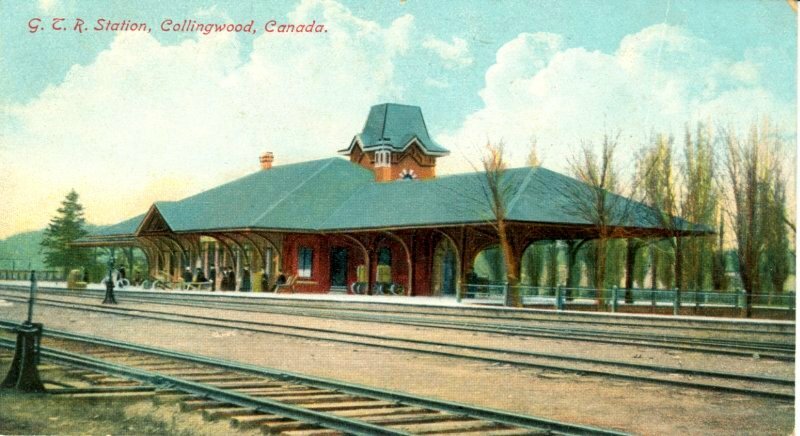 station at Collingwood damaged by fire; extended platform canopies and tower lost The Northern Advance (Barrie)Thursday, March 17, 1932, p. 3, col. 5 & p. 8, col. 2; Cooper-2001, p. 285 . 1932-10-03 C.N.Rys. officially opens reconstructed station at Collingwood The Northern Advance (Barrie)Thursday, October 26, 1932, p. 6, col. 5 . 1997c C.N.Rys. 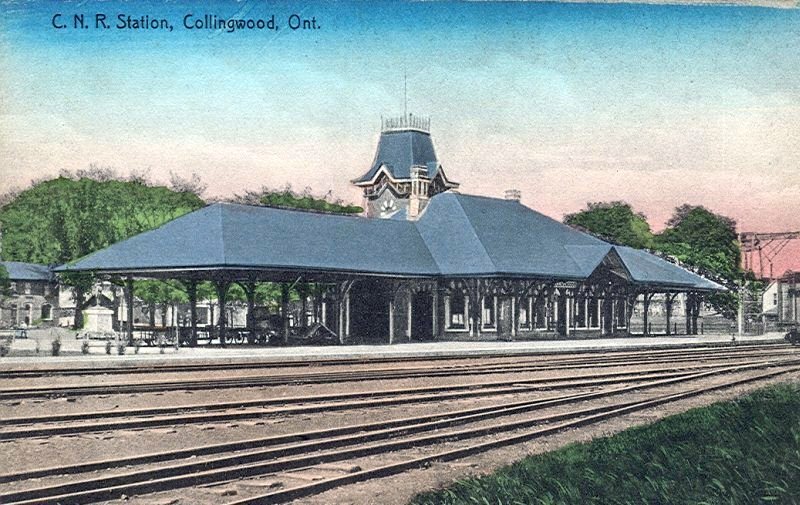 station at Collingwood demolished Cooper-2001, p. 285 . 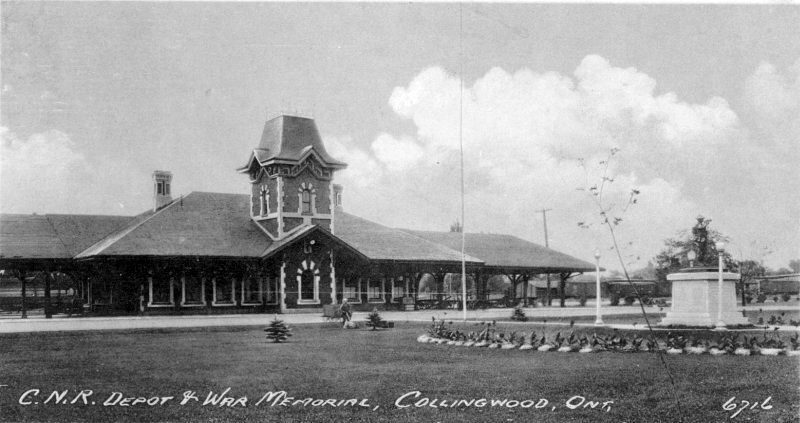 1998-09-19 Replica station opens as Collingwood Museum and Welcome Centre Cooper-2001, p. 285 . NAC / B-012438 OS&HUR station. Andrew Merrilees Collection / NAC / B-013568 GTR station built 1874, burned March 12, 1932. Andrew Merrilees Collection / NAC / PA-138974 OS&HUR station, showing Ryley House and Malakoff Hotel. Andrew Merrilees Collection / NAC / PA-138976 OS&HUR depot, showing roundhouse on left and freight office on right. Ross Gray Collection GTR station. JPS Collection Postcard view of station in the late GTR era. Published by Stedman Bros., Brantford, Canada. Made in Germany. Postally unused. Andrew Merrilees Collection / NAC / B-012214 Employees in front of CNR/GTR station. JPS Collection Postcard view of station in the early CNR era. JPS Collection Postcard view of station in the early CNR era. Published by The B.C. Printing & Litho Ltd., Vancouver, BC. Postally unused. NAC / PA-138976 CNR station. CNR photo X-34497 Collingwood Terminal Elevators. CTSM / CN Photo Collection / Image CN004818 Ornamental gardens at station. Charles Cooper photo / SCM CNR station. Charles Cooper photo / SCM Station. 1870 NAC/NMC96577 N.Ry. of C. Station. Plan. Front elevation. 1870 NAC/NMC96578 N.Ry. of C. Station. End elevation. Sections. 1870 NAC/NMC96579 N.Ry. of C. Station. Plan. Front elevation. 1884 NAC / Col. RG30M Acc. 81293/55 Item 205 N.Ry. of C. Track plan. 1894 NAC / Col. RG30M Acc. 81293/55 Item 206 G.T.Ry. Track plan. Collingwood Meat Co. and R. Emerson sidings. 1894 NAC / Col. RG30M Acc. 81293/55 Item 208 G.T.Ry. Track plan. Georgian Bay Lumber Co. sidings. 1895-04-08 NAC / Col. RG30M Acc. 934002 Item 13 G.T.Ry. Track plan. 1in.=50ft. 1930-09-01 NAC/NMC96584 C.N.Rys. Station. Proposed intermediate walls under floor. 1932 NAC/NMC96585 C.N.Rys. Proposed alterations to station. Millwork details. 1932 NAC/NMC96586 C.N.Rys. Proposed alterations to station. Ticket wicket grille. 1932 NAC/NMC96587 C.N.Rys. Proposed alterations to station. Window trim. 1932 NAC/NMC96588 C.N.Rys. Proposed alterations to station. Bent plate truss details. 1932 NAC/NMC96589 C.N.Rys. Proposed alterations to station. Sash detail. 1932 NAC/NMC96590 C.N.Rys. Proposed alterations to station. Millwork details. 1932 NAC/NMC96591 C.N.Rys. Proposed alterations to station. Heading and lighting plans. 1932 NAC/NMC96592 C.N.Rys. Proposed alterations to station. Truss detail. 1932 NAC/NMC96593 C.N.Rys. Proposed alterations to station. Street, end and track elevations. Section. 1932 NAC/NMC96594 C.N.Rys. Proposed alterations to station. Plans. End Elevation. Sections. Truss post details. 1932 NAC/NMC96596 C.N.Rys. Proposed alterations to station. Street and end elevations. Section. 1932 NAC/NMC96598 C.N.Rys. Proposed alterations to station. End elevation. Plan. Foundation plan. Section. 1932 NAC/NMC96599 C.N.Rys. Proposed alterations to station. Door details. 1932 NAC/NMC96600 C.N.Rys. Proposed alterations to station. Agent office grille detail. 1932 NAC/NMC96601 C.N.Rys. Proposed alterations to station. Counter, lavatory partition, etc. details. 1932 NAC/NMC96602 C.N.Rys. Proposed alterations to station. Dutch door and cash drawer details. 1932 NAC/NMC96603 C.N.Rys. Proposed alterations to station. Agent office screen detail. 1932 NAC / 96604 C.N.Rys. Proposed alterations to station. Agents office screen detail. 1932 NAC / 96610 C.N.Rys. Existing station. Enamelled name plate detail. 1932 NAC / 96611 C.N.Rys. Existing station. Enamelled name plate detail. 1932 NAC / 96612 C.N.Rys. Existing station. Enamelled name plate detail. 1932 NAC/NMC96613 C.N.Rys. Existing station. Enamelled name plate detail. 1932 NAC/NMC96614 C.N.Rys. Existing station. Enamelled name plate detail. 1932 NAC / 96618 C.N.Rys. Existing station. Window details. 1932 NAC / 96620 C.N.Rys. Proposed alterations to station. Plan, section and elevations of waiting room doors. 1932 NAC / 96622 C.N.Rys. Existing station. Truss section. 1953 NAC / 96623 C.N.Rys. Proposed addition to station for express facilities. Plans. Location plan. Elevations. Details.